Dawn breaks later as autumn draws nearer, making it that much harder to wake up every morning. Perhaps that’s just an excuse. Our bodies are tired and it’s hard to motivate to get up before 6am. We’re tired but that’s just an excuse too. Getting up early is a mental challenge. If we had to hike 23 – 27 miles you bet we’d wake up early. But as of late we’ve been hiking less than 20 miles per day. Today was no different. 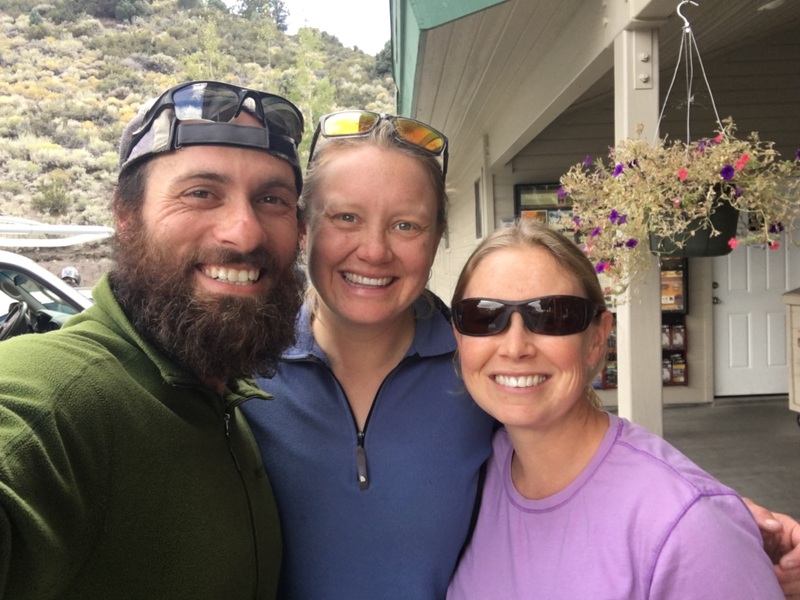 Although we were meeting Laurie’s mom Sue at Tuolumne Meadows, we weren’t in a rush because we told her we’d be there between 10 and 11am. The morning air was cool but not very cold. As we descended into Lyell Canyon however, it got colder. 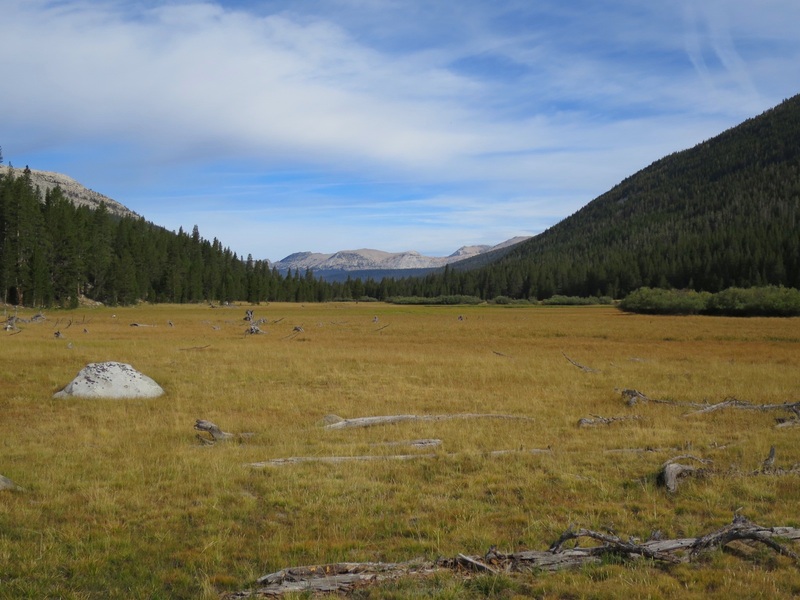 Cool air settles into this beautiful meadow and it can be downright bone chilling cold. 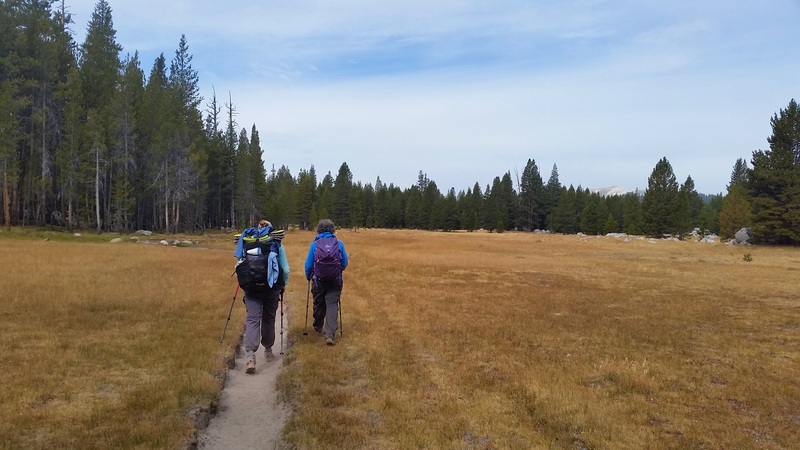 We passed many hikers camped in various places along Lyell Canyon as we descended the rocky steps and dusty trail. No matter how many times we visit this place, the beauty never ceases. Belding ground squirells darted in and out of their holes as we walked by. We stopped and smiled as one stuck it’s head out, saw us and retreated inside. 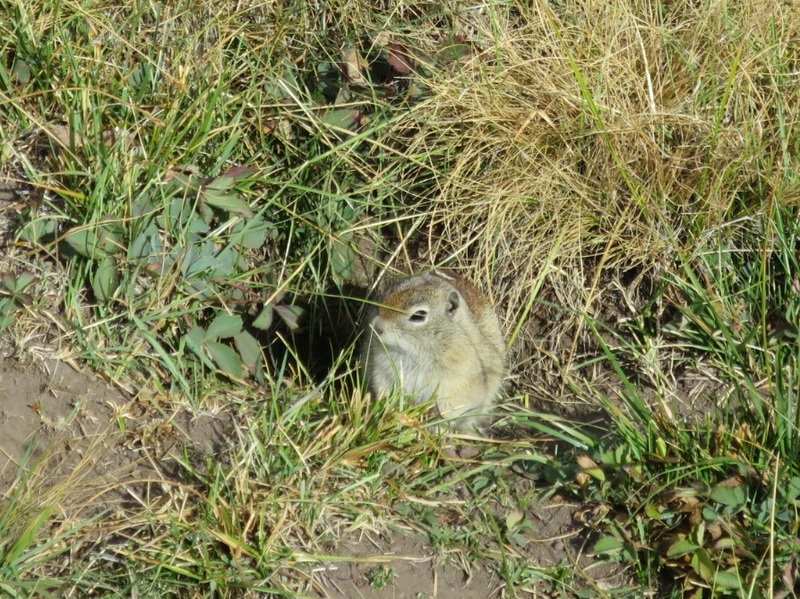 These little rodents were so cute! Just after 10am we recognized a woman with curly hair wearing a blue jacket standing next to the trail. It was Sue! 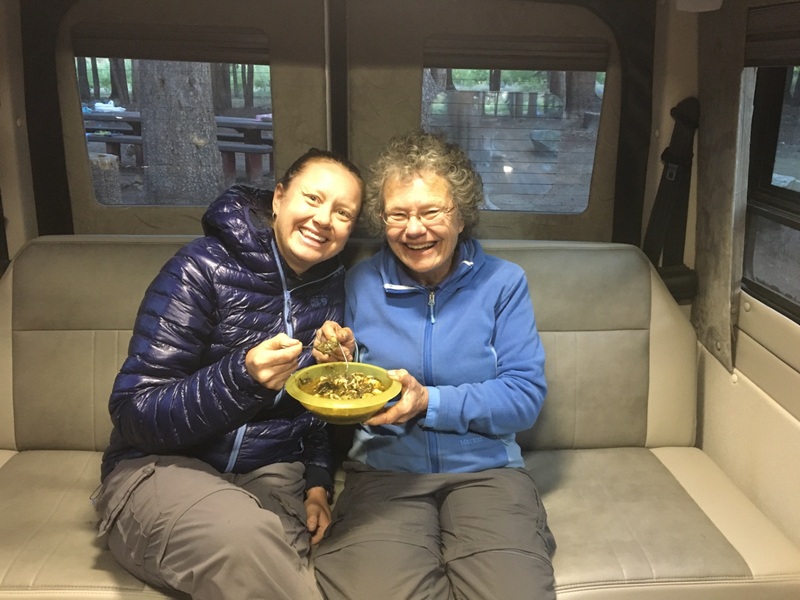 Laurie loves bumping into her mama on the trail. It brings a smile to both of their faces. The three of us walked almost 5 miles to a beautiful meadow where the Lyell Fork once again intersects the trail. This is one of Laurie’s favorite places. In fact, she has talked about wanting to get married there! As we soaked our feet in the cold water we noticed dark clouds gathered above. There have been signs of a low pressure system approaching the last few days (Andy’s had his eye on the clouds) but there was no rain in the forecast. We laced up our shoes and braced ourselves for what was to come. 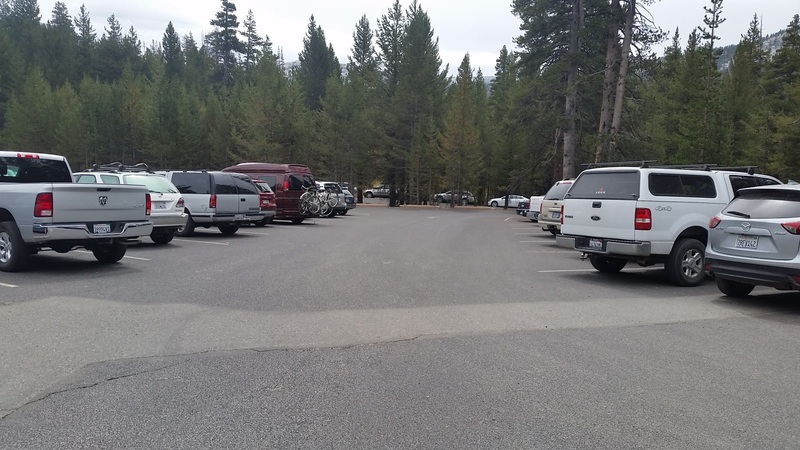 Labor Day weekend is probably the busiest weekend for many places – including Yosemite. 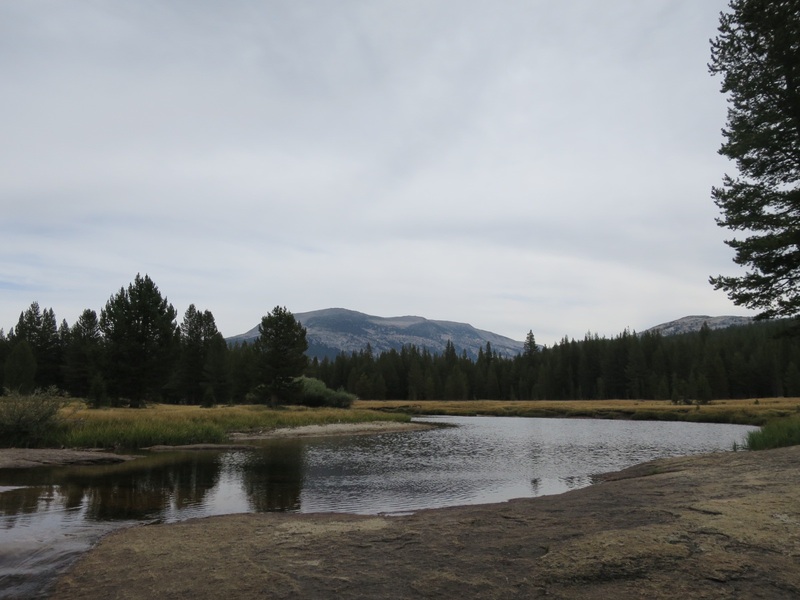 Tuolumne Meadows and the few miles of the JMT near it were busy with day hikers, backpackers and people out to get a moment of fresh air. In the parking lot Andy felt like he was back in college. Whenever someone came off the trail motorists asked them if they were leaving in hopes of snagging a spot. Needless to say we got outta there quickly. 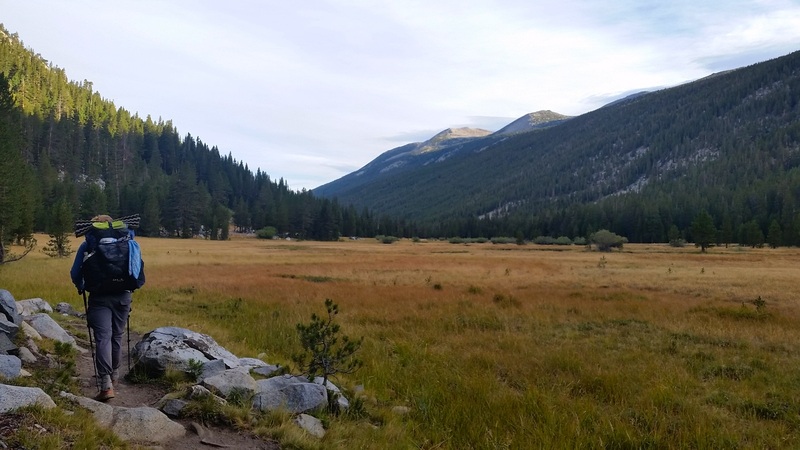 Sue had secured a campsite near Virginia Lakes 20 minutes north of Yosemite. But before we went there we stopped at the Mobil gas station in Lee Vining to meet with Laurie’s friend Colleen, eat and do laundry. 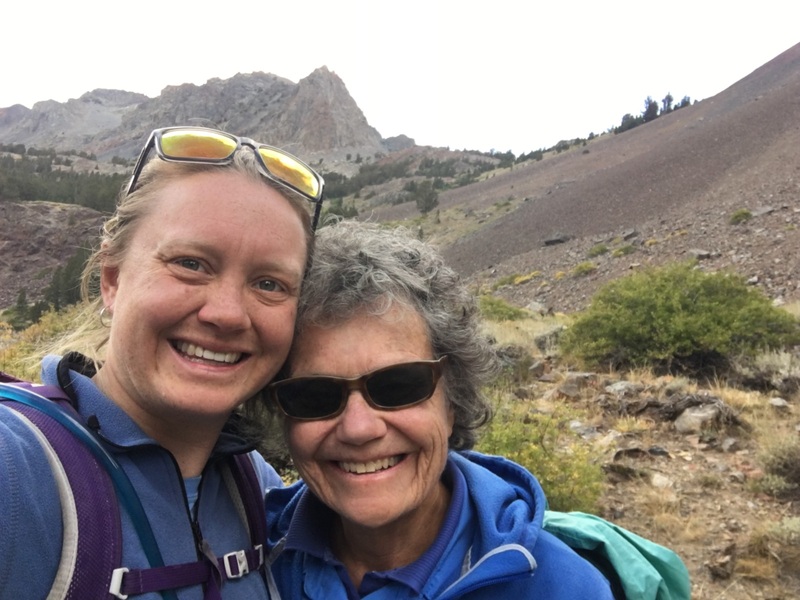 Colleen was in Lee Vining on her way to Mammoth for a 3 day backpacking trip. We hadn’t planned it but happened to be in the same area at the same time. We really couldn’t have planned it any better! Colleen is a very sweet, thoughtful and generous person. It was nice catching up over lunch. 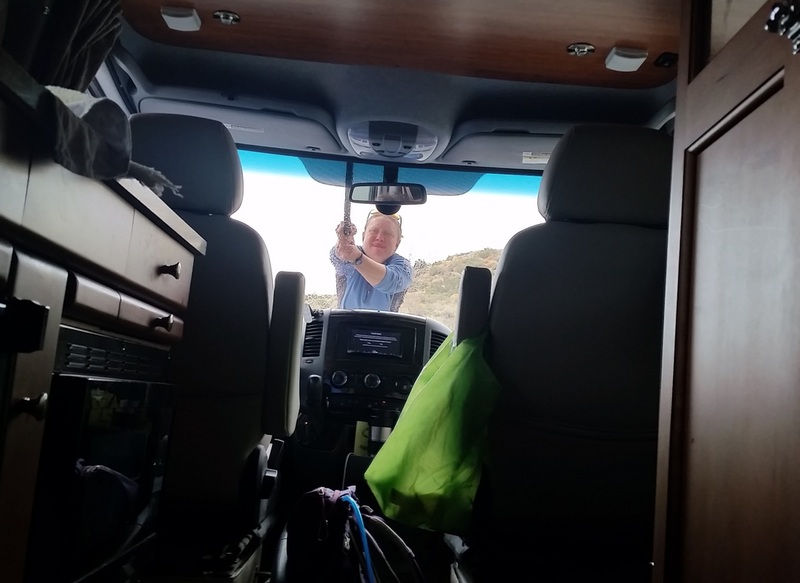 After saying goodbye we drove to the campground. Sue and Laurie went for a ‘short hike’ which turned into a 2.5 hour adventure. In the meantime Andy got to relax at camp, set up home, do his resupply, listen to music and chat with people camped nearby. After the sun set behind the jagged peaks it got cold. 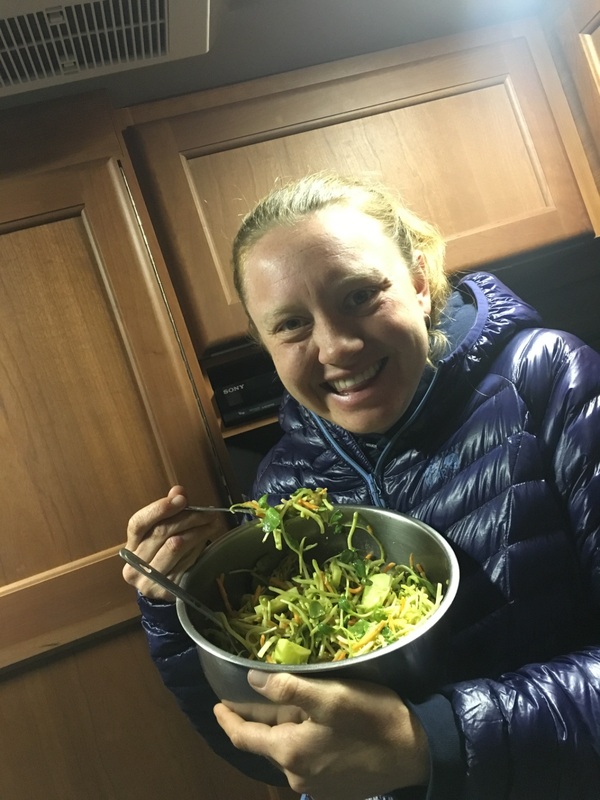 We all piled into Sue’s van, drank hot water and ate dinner. The packaged saag paneer with chicken was good but we were both looking forward to the salad. Oh how we miss the taste (and crunch) of fresh greens with avocado, sprouts and other veggies. After dinner we relaxed, looked at maps and drank more hot water. We were in bed before 10pm, determined to leave camp by 6:30 the next morning to get to Yosemite early enough to get a parking spot at the trailhead. It’s going to be cold tonight, especially without the fly on, but we’ll be cozy because we are sleeping in cotton tshirts and sweatshirts. Oh the luxury! Tonight we are grateful for impromptu rendezvous with good friends and time with family. Great to see you Colleen!